Anita, daughter of the local police chief, is not only having nightmares where she is stalked by a sinister figure with a mutilated face and knives attached to his fingers, but is also waking up with cuts on her arms. As both her friends and enemies from school start to die in mysterious and bloody circumstances, Anita discovers that not only does the man in her bad dreams have a link to an unsavory incident in her family's past, but every bad dream brings him one step closer to permanently re-entering the real world. 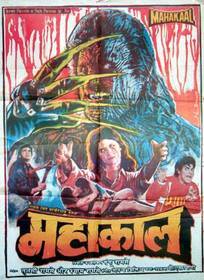 Mahakaal was made by Shyam and Tulsi Ramsay, two of the Ramsay brothers, a successful team of filmmakers working in the genre known as Bollywood (an amalgamation of the old name of India's capital city Bombay, with Hollywood). Indian film producers, like those in Turkey and Italy, have never been afraid of cashing in on the success of their US counterparts with everything from Mrs. Doubtfire to Reservoir Dogs and Fight Club1 all coming in for the unofficial remake treatment. Bollywood films are sometimes referred to as "Masala" films, after the term for a mix of spices in South Asian cuisine2 and when it comes to remakes, whatever the original may have contained, the Masala version will almost always have the staple ingredients of action, comedy, romance, melodrama and endless song and dance numbers that do nothing to advance the story. The combination is particularly irritating in the horror genre. Whenever a sustained air of menace or tension is building, this is quickly derailed, either by one of several rambling sub-plots, the flamboyant comedy relief antics of supporting actor Johnny Lever (who appears to be India's answer to Jerry Lewis and Jim Carrey) or ANOTHER of the interminable song and dance routines. These three elements combined take up at least 40 of the film's 133 minutes. Which is a shame, because Mahakaal contains some genuinely effective horror elements. The monster's make up is well done, and his lair is a great piece of production design, particularly the centerpiece which appears to be a giant skull made from the mummified bodies of small children. The nightmare and murder sequences are tense and effective, with creepy synth music and some vivid cinematography, using over-saturated primary colors in a way reminiscent of Suspiria. In addition, there are some nice surreal touches such as dozens of hands bursting through a wall to grab at Anita or the killers head popping up inside a fish tank to taunt her. The Freddy Krueger figure here is Shakaal, a sorcerer who was sacrificing children to increase his powers. One of these children was Anita's younger sister and, frustrated by his own department's inability to stop Shakaal, her father took the law into his own hands by capturing and burying him alive. This first change raises a plot anomaly - why does Shakaal look like he's been set on fire when he was merely shut in a coffin? There are two further changes, one in character, the other in setting, that leave the film weaker overall. In A Nightmare on Elm Street, Nancy is more pro-active in taking the fight directly to Freddy on his own ground, bringing him back to her world, and then destroying him. In Mahakaal, Anita is a much more passive character, spending the majority of her screen time having things happen to her or watching them happen to other people and in keeping with this, the climax of the film is changed to a punch up between Shakaal and Anita's boyfriend. This raises a further plot anomaly, namely, how can a supernatural demon that can kill you in your sleep and who potentially has the power to take over the world (at least according to the Indian holy man Anita goes to see, another sub-plot quickly forgotten about) be defeated in a straightforward brawl? The answer, presumably, is that the producers realised they were a few minutes short of the action quota for their "Masala" mix. There is another more subtle change which leaves the horror elements in Mahakaal somewhat diminished. A lot of the tension in A Nightmare on Elm Street comes from the contrast between the safe, controlled, rational suburban world that the parents try to create to protect their children and the dangerous, chaotic supernatural dream landscape that Freddy inhabits. Because Mahakaal takes place in a world where magic and sorcery are seemingly commonplace and accepted, and, moreover, people burst into song (with full musical backing) at any excuse, a supernatural being attacking people in their dreams is in danger of becoming merely one more fantastic thing in an already fantastic world. There are plenty of examples of horror mixing successfully with other genres - An American Werewolf in London being a classic where the horror is genuinely scary and the comedy genuinely funny and both work together to help tell the story. While I am not enough of a Bollywood expert to comment on how well the blend of elements works generally within the genre, with Mahakaal, the music and comedy pieces are so far removed from the central premise that after a while you begin to feel as though you are watching two or three different films edited together in a very ham-fisted fashion. Taking them out would have left a much more tightly paced story, with enough shocks, gore and weirdness for an enjoyable, if derivative horror movie instead of a standard piece of Bollywood product with elements of horror crudely spliced in. Submitted by FreeMoviesWatch on Fri, 2011-03-18 04:40. To be honest I was a bit disappointed about this movie. I love Indians movies but my opinion is that horror is not what they are best at. Submitted by Indian (not verified) on Sat, 2011-08-06 08:05. Submitted by wedding rings (not verified) on Sat, 2013-07-06 12:54. There is another more subtle change which leaves the horror elements in Mahakaal somewhat diminished. A lot of the tension in A Nightmare on Elm Street comes from the contrast between the safe, controlled, rational suburban world that the parents try to create to protect their children and the dangerous, chaotic supernatural dream landscape that Freddy inhabits.